When people talk about the Swinging Sixties I usually come out in a rash. It’s a kind of allergy to Baby Boomer self regard and their seeming belief that their youth was the only time when people truly lived. I overcame this reaction for a show at Sotheby’s. Yes! A show, not a sale preview. A large one of work from Swinging London in the 1960s, it is curated by London dealer Kasmin, now surely retired but presumably still an enfant terrible in those days. The intention is explicitly to promote artists whose names have fallen into obscurity in the intervening years. David Hockney alone remains a celebrity. Others, Howard Hodgkin, Richard Hamilton, Barry Flanagan will be familiar to Art fans, but perhaps less so to a wider audience. But even Art fans (like me) will find some new names here, and remember one or two once heard names and see some of their best work. A lot of work here has been loaned from private collections – Kasmin is no doubt very well placed to assemble such a show. Conscious parallels are drawn between the era of Hockney and that of Hirst. Looking back on Sensation from the vantage point of 2013 it does indeed look as if Cool Britannia was an awkward ersatz rehash of what had been a genuine efflorescence of all the arts in the 1960s. But the turnover of the gallery business has led to some of the less fortunate being left to gather dust. And some of the styles of work do look very dated. Or due for a revival. Or perhaps I missed the revival…Robyn Denny’s Hard Edge abstraction in acrylic on canvas. Very 1960s. But I liked them a lot: these were strong, considered, had a totemic presence. Denny deserves to be considered alongside Frank Stella, but I doubt he is. I do actually remember the revival of this genre – the Neo Geos Philip Taafe, Ashley Bickerton et al. An after echo, like Lenny Kravitz to Jimi Hendrix. I think this era everywhere saw artists scouring the edges of abstraction and slowly coming back to hints of figuration. 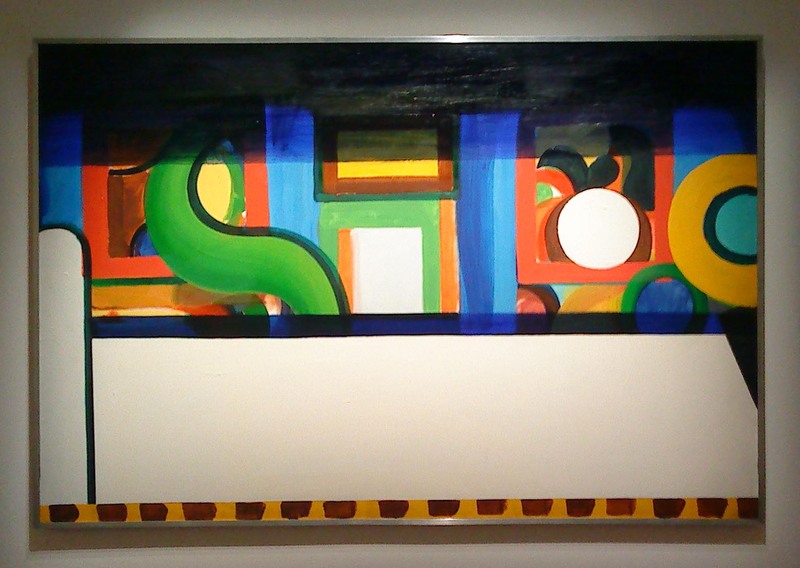 There is a very nice early Howard Hodgkin painting here that shows this perfectly – as does the development of his work since. But there are also works that seem to derive more from maps and diagrams – Rita Donagh and Jeremy Moon (a new name to me) had curious and beguiling work here. Its setting certainly imbued it with dignity – it was like being at a party with a lot of distinguished guests who hadn’t seen each other for a long time. Maybe the Sixties did have something to shout about. Now, I need to put some cream on my rash. This entry was posted in Art, Auctions, British, Galleries, London, Modernism, Painting, Uncategorized and tagged 1960s, Art, British, david hockney, frank stella, Galleries, Howard Hodgkin, London, Painting, sotheby s, Swinging Sixties.